10.25.2015 Frogs Are Green is featured on page 3 of the Jersey City Reporter in the latest article by Al Sullivan about the annual international Kids Art Contest titled: The Frogs Are Coming! 10.16.2015 Susan Newman Design Inc and Frogs Are Green Inc are featured in the October issue of Graphic Design USA. Each October the magazine features approximate 10-12 “responsible designers / design studios” from around the country. 6.17.2015 The City of Jersey City films the Frogs Are Green opening reception at City Hall’s 2nd floor Rotunda gallery. On exhibition were the winners of the 2014 Kids Art Contest. 3.6.2015 Jersey City Warms Up for Spring Frogs Are Green and 58 Gallery present “Green Dream Jersey City.” March 1-29, 2015. 1.17.2015 Turkey’s Haber Stargazete announces winners in the 2014 Frogs Are Green Kids Art Contest! 12.30.2014 – I want to thank Lauri Fortino, children’s book author and library assistant, who writes a blog called Frog On A Blog for nominating Frogs Are Green for the Very Inspiring Blogger Award! 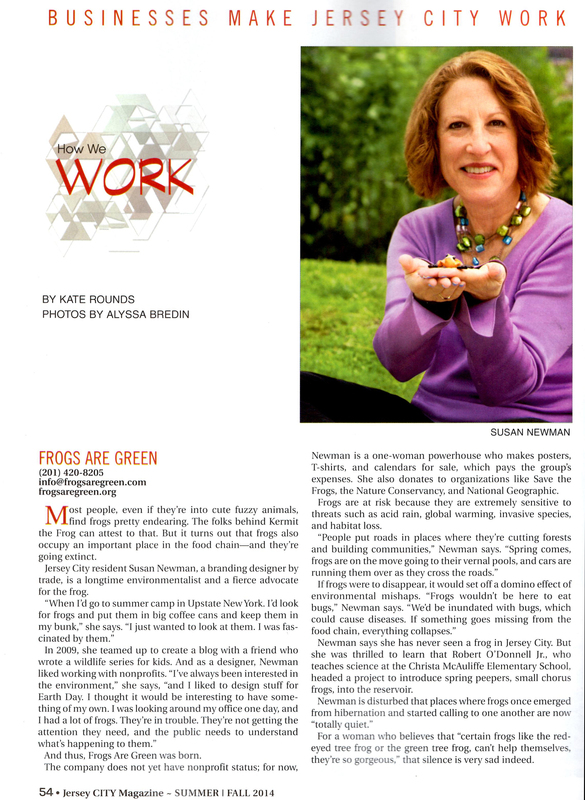 8.1.2014 – Susan Newman, founder of Frogs Are Green is interviewed in Jersey City Magazine, Summer/Fall Issue by Kate Rounds, Photography by Alyssa Bredin. 7.24.2014 – 5 of Frogs Are Green environmental posters are displayed in New York City’s Times Square in the international exhibition, #SeeMeTakeover by See(dot)Me. 12/21/2013 and 12/28/2013 – Frogs Are Green founder, Susan Newman is interviewed by Jonathan Kersting and Audrey Russo on TechVibe, on iHeart Radio 104.7 FM . Part of the interview is what this organization is about and engaging kids around the world in the kids art contest, as well as the photography contests each year. 12/13/2013 – Susan Newman is one of the speakers in a terrific line up in the 2014 Marketing Jump Start Telesummit – My interview aired on 12/13/2013 at 3pm EST and is mostly focused on “brand visibility” online and offline and is just as important if not more so for organizations. I do talk about Frogs Are Green also toward the end. 8.14.2013 Susan’ organization, Frogs Are Green and the now open Kids’ Art Contest is Featured in the Jersey City Independent online. 7.25.2013 Susan Newman’s environmental poster design work is included in the show, “The Story of the Creative” an international exhibition at Angel Orensanz Foundation for Contemporary Art. To see the online digital portfolio at see.me visit http://susannewmandesign.see.me The show will then be seen at See.me’s Long Island City gallery through September 10. 3.19.2012 – Susan Newman, co-founder of Frogs Are Green is interviewed on the Techno Granny Radio show, spreading the awareness about our organization and efforts through community sites, social media, products like tee shirts and earth day posters and annual photo and kids’ art contests. 6.22.11 (in Archives) – Frogs Are Green is featured on the front page of Paper.li (The Conservation Photo Daily) for our fun contests, which are now open! 1.3.11 – Frogs Are Green wins a 2010 design award from Graphic Design USA for our frog conservation poster, “We Cannot Do This Alone.” To view the gallery of winning designs, click here. 12.24.10 – Interview on Green Marketing TV by Maryruth Belsey Priebe, “Social Entrepreneurs Make It easy for Frogs to be Green. 11.22.10 – Susan Newman is interviewed about both Susan Newman Design Inc and Frogs Are Green by Caroline Dowd-Higgins for her blog. 11.1.2010 – Kids-List – Frogs Are Green’s kids’ art contest is featured in the Kids-List November Newsletter. The Kids-List website finds local enrichment activities for your child. Music, dance, fitness, sports, and more, Kids-List is the most comprehensive resource for kid’s activities in your neighborhood. For the second year , Frogs are Green is accepting submissions to their photo contest. 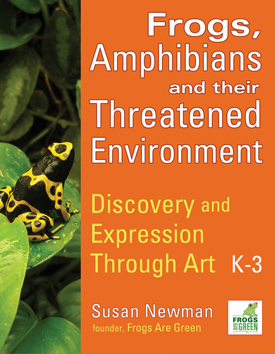 Enter in one of two categories: Frogs in the Wild and Backyard Frogs. Backyard Frog photos would include such photos as a frog perched on your picnic table or other unusual place. Frogs in the Wild photos, on the other hand, should feature frogs, toads, or other amphibians in their natural habitat: frog ponds, marshes, in the woods, and so on. 4.30.2010 – thebokenonline.com – SAVE THE FROGS Day! Thanks to “thebokenonline” for featuring our cause, our display at Hoboken City Hall and the Save the Frogs cause today—on Save the Frogs day! 4.13.2010 – Hoboken411.com posts about our Earth Day contest and our display on the 2nd floor of Hoboken City Hall. We’re happy to be recognized on the Hoboken411.com website reminding people about the 40th anniversary of Earth Day, which is April 22, 2010. Hoboken411 visited our display, outside the Mayor’s office on the 2nd floor and shot some photos. Eco-Libris features the poster designs I created for this year’s 40th Anniversary celebration of Earth Day. Here at Frogs Are Green we’re having a Earth Day contest so follow this link and submit your ideas, to win a free poster or t-shirt. 2.21.2010 – Frogs Are Green is featured on the website Patch.com. Written by Rich Monetti. We were contacted by this writer a few weeks ago because he was very interested in our cause. After a short interview, here’s the published article along with a few photos of our display in Hoboken City Hall. On the second floor of Hoboken’s City Hall building, there are glass cases for arranging displays. Frogs Are Green was thrilled to be asked to gather materials to enlighten the public and bring awareness on this important issue. Inside the display case are posters, flyers, t-shirts, wristbands, assorted books. We posted a call to action notice to teachers and students asking for them to get involved by teaching students about this subject by drawing or painting Frogs. Below are a few pictures of the display, go check it out! We were interviewed on PlanetShifter.com by Willi Paul. The title of the interview is, “Kiss a Frog: Save a Planet.” He asked us a series of questions ranging from what frogs symbolize to the success of the Prince’s Rainforest Project to whether there really is an amphibian crisis. On Tuesday, November 10, 2009, at 1:00 pm, eastern time, over 100 bloggers took a stand to support books printed in an eco-friendly manner by simultaneously publishing reviews of more than 100 such books. Our own, Mary Jo Rhodes ofFrogs Are Green was proud to be one of the bloggers, reviewing, “Chasing Molecules: Poisonous Products, Human Health, and the Promise of Green Chemistry.” Susan Newman also participated by designing the logo for the event started by Eco-Libris, as well as reviewing a children’s book called “Hope and the Super Green Highway” on her i-tees blog. We’re proud to have been selected as one of eleven design studios featured in the October Issue of Graphic Design USA. The “green” issue only comes out once a year. It features both, Susan Newman Design Inc and Frogs Are Green. Prospere Magazine made its debut online on January 8, 2008. Following its initial three months, the magazine moved from a monthly to a weekly publication. Prospere Magazine makes content updates daily, including exciting company profiles, designer profiles and regular polls. We’re happy to be featured in the business profile section for our cause, Frogs Are Green. The July “green” newslettter from Graphic Design USA (GDUSA) came through Wednesday, July 29, 2009 and Frogs Are Green was mentioned asking artists to “hop on in and get involved.” The goal of our blog is to raise awareness of the frog extinction crisis and explore the link between healthy frogs and a healthy planet. Read the important posts, feel free to comment, donate to any of the organizations we have listed in our blogroll, or just buy a tee (and we’ll donate for you).